Surely this has to be one of the reasons more people are moving to Philadelphia. Along with the affordability, the food, the tight community, and the parks. You might not know it, but right now Philadelphia is bucking a national trend. The recession has made immigration plateau across the United States, after 30 years of exponential growth. Even the drift south and west has slowed. Yet a recent report by the Pew Charitable Trusts’ Philadelphia Research Initiative found there has been a steady rise in the number of people hauling boxes and furniture from other American cities into Philadelphia. Twice as many people move here from New York each year as did in the mid-’90s. I wouldn’t be a true resident of this self-deprecating town if I didn’t point out that more people are still leaving the city than coming in – this has been happening for decades and is considered normal in a place where there are more births than deaths. But the net outflow of people has halved in recent years, and this survey did not include foreign immigrants, who are flocking here. A 2008 Brookings Report found that, “among its peers, metropolitan Philadelphia has the largest and fastest growing [foreign] immigrant population” – which was then, at 500,000 people, 9 percent of the total population. Forty percent of those immigrants are from Asia. Well over half of them came to the United States after 1990. And, as important, almost three quarters of the growth in greater Philadelphia’s labor force since 2000 is due to immigrants. In the 1990s, only one-third of this growth was attributable to immigrants. What is most fascinating is why people move to this country, particularly in a bleak economic climate. In 2005, I left my native Australia for America and a job at Newsweek, abandoning beautiful, unspoiled beaches for unlived dreams, seasons, and the love of a country I had lived in as a child. Since the recession has dampened immigration, why do such a large number of us still come here, when unemployment hovers at 9 percent, and the chances of reducing the deficit in the next decade are so slim? One of the most powerful, least-discussed reasons is that we are drawn to the ideas America was founded on: the glorious, compelling, still-radical ideas of freedom, democracy, and certain inalienable rights. The fact that a group of men declared in 1776 that all men were created equal (not blacks, or women, but those fights were yet to come) and that we are still hotly debating what that means today. These ideas are most obvious in Philadelphia. The flags sticking up from the graves of soldiers who fought in the Revolutionary War; the modest house of Betsy Ross, the woman who lost two men she loved in that war, but who stitched the first Stars and Stripes with dexterous fingers; the street signs marking the path of the Underground Railroad. 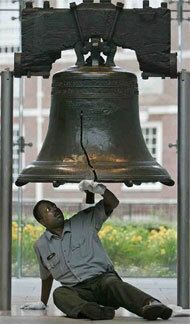 And, of course, that bell. This is why I am most proud to call this city, the one that produced Bill Cosby and Billie Holiday, as well as Margaret Mead and Benjamin Franklin, home. That and free pizza. Posted in Philadelphia Inquirer. Bookmark the permalink.